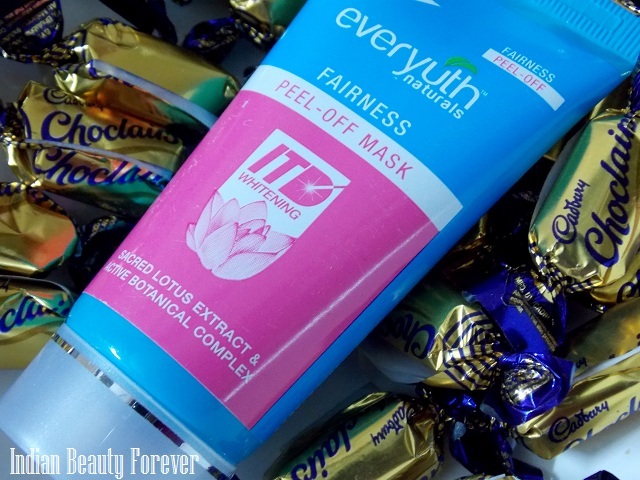 I will review Everyuth Naturals Fairness Peel Off mask with lotus extracts today. I have used their Everyuth golden glow peel off mask earlier. This is their newly launched peel off mask. I get to try it a couple of weeks ago and ready to share my views on it! I like peel off ones as I find them less messy as compared to those masks which you have to wash away. 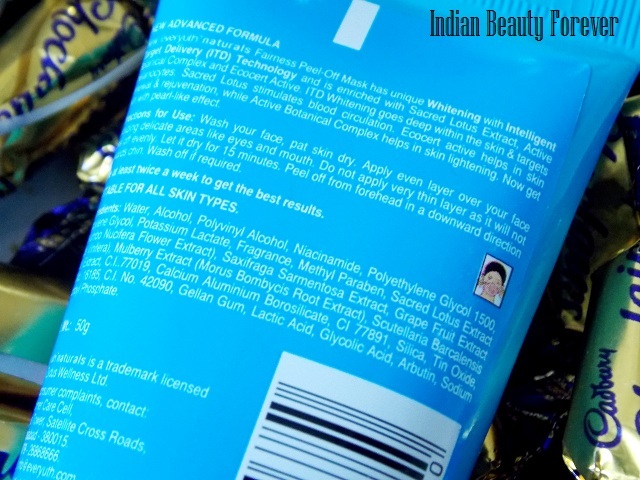 This fairness mask is priced at 75 rupees for 50 g which is the smaller pack! How to use: Wash your face and pat your skin dry. Apply a thick even layer with the help of your fingers, avoiding delicate areas like mouth and eyes. Do not apply a thin layer as it will be difficult to get rid of it. Let it dry completely, it will take 15-20 minutes. Peel off from forehead to downwards. Experience: I have used this fairness peel of mask twice now. Before this I have also used their golden glow peel off mask which is a quite famous product. It comes in a regular blue tube with a cap. If you have see that one, It was pale orange in color while this mask is transparent gel looking texture with very fine shimmery blue silver particles that gives it a blue hue. It smells mild and more on the pleasant side. Its smell resembles a good smelling cream or soap. Consistency is medium, it isn’t too runny or thick that would make it difficult to use rather it has a perfect consistency which spreads evenly and nicely on the face and on the contours of the face. 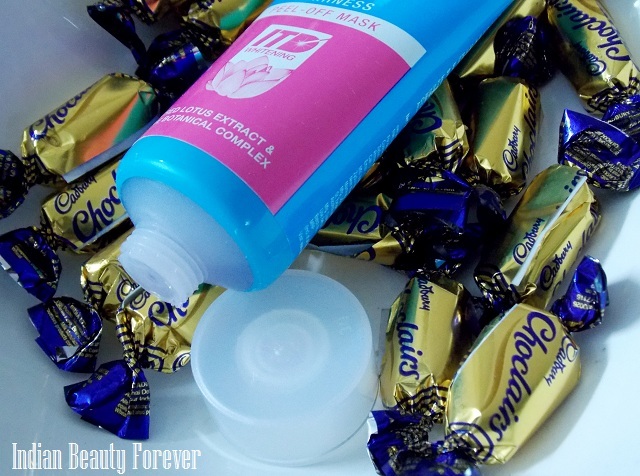 The first time I squeeze this product out of the tube, I was like mesmerized by its beautiful texture. I applied it with my fingers evenly on my face and reapplied some more wherever required as too thin layer can be difficult to peel off. I kept it on my face till it was dried completely and starting from my forehead. I tried to peel it and the mask came out, at some places it was too thin so I have to rub the area and it came out. I felt my skin was softer and brighter as it really made it even toned. One thing I would like to add here is that while the mask dries, it feels tight on the face and when you remove it, you can feel blood pumping through and this can be a reason skin looks better than before! As it came out completely, I didn’t feel the need to wash my face but I saw there was some oil on my nose so, I had to wash off with plain water. This peel off mask said to give whitening effect to your skin and contains sacred lotus extracts (Nelumba Nucifera) and botanical complex though I have not seen whitening as such but yes, skin looked brighter and better than before that I have mentioned earlier. The toned effects that I noticed were there for 5-6 hours which is fine as it can be an instant savior when you are going to attend a function or events. It’s quick and effective that way. It’s a peel off mask so, you have to be careful, as in apply a thick layer if you have too many hairs on your face. Thin layer will hurt you while peeling it off and you may have to wash it off to get rid of it! I have not seen it available online yet as it’s a new launch but it would be there in the shops and may be soon it will be available online as well. Price is decent for the quantity which is 75 rupees for 50 ml. This 50 gm pack will last for 6-7 uses or even more. It can brighten but may not lighten/whiten as such. 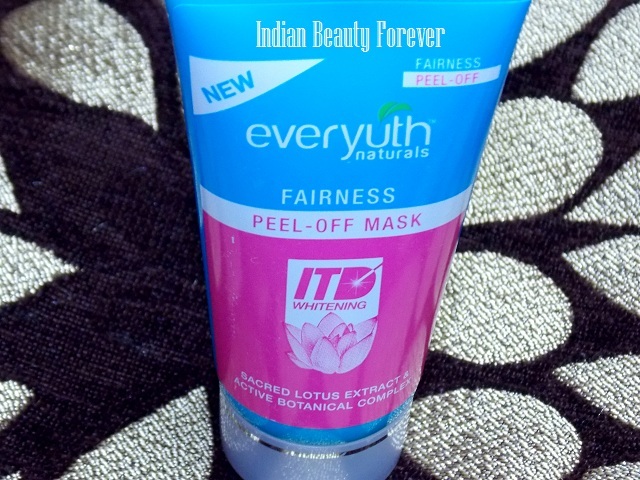 Take- Everyuth Naturals Fairness Peel Off mask can be an instant skin brightener which tones and makes skin look better. You can try it before any occasion or function. It’s affordable and decent quantity at this price makes it a budget peel off mask. Enter the Giveaway here, where you can win a pack of this mask. Great review about this product. sounds good...always like everyuth products! Seems like a very good instant perking up product! I like the sparkle in the product, looks so fun! We need things like this every now and again! Loved the pictures dear and the review dear ! I want chocs Nieshu :) Lovely review. Will try it soon! Thank you saniya!! range one is great! Seems like a decent product! i need to buy this!! thnx for the review!!! btw...those chocolates for me? Thank you dear!! :) Hope u like! Thanx for giving the useful review for us i will try to use this wedding season.